Norway has large amounts of unutilized biomass, and it is important to process these renewable resources to products that can replace fossil fuel. Gasification of biomass is a promising technology for this purpose. Optimization of the process is crucial. The influence of bed material, gas and particle residence time, feed rate, feed temperature, catalyst, type and size of feedstock are studied in the pilot gasifier located at USN. Online gas analyzers are used to measure the composition of the producer gas. Tar is measured with respect to quantity and quality. Temperature and pressure are measured at different positions in the gasifier. The feed rates of biomass and steam are controlled based on the temperature in the reactor. 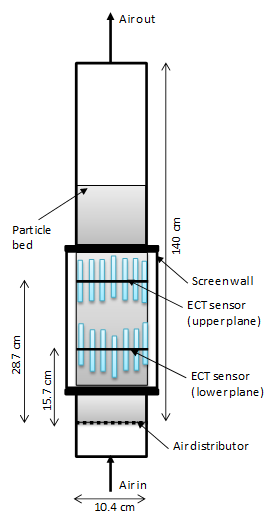 Experimental cold flow fluidized beds are used to study the flow behavior and segregation tendency. The main cold flow model has the same dimensions as the pilot gasification reactor. 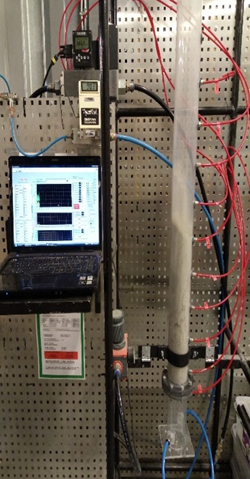 Measurements of flow behavior (bubble activity, mixing, segregation) are performed using electrical capacitance tomography (ECT), pressure sensors, flow indicators and controllers. Additionally to the bubbling fluidized bed gasifier located at USN, a cold-flow dual fluidized bed is available at BOKU. The results of the cold flow tests and modelling will be used to validate CFD/CFPD models and to support the design of an improved reactor. Cornelius Emeka Agu, Lars-André Tokheim, Marianne Eikeland, Britt M.E. Moldestad, (2017), Determination of onset of bubbling and slugging in a fluidized bed using a dual-plane electrical capacitance tomography system, Chemical Engineering Journal, 2017, 328, pp 997-1008. Janitha Chandimal Bandara, Marianne Sørflaten Eikeland and Britt Margrethe Emilie Moldestad, (2017), Analyzing the effects of particle density, size, size distribution and shape for minimum fluidization velocity with Eulerian-Lagrangian CFD simulation, Proceedings of the 58th International Conference of Scandinavian Simulation Society, SIMS 2017, Reykjavik, Iceland. Kjell-Arne Solli .Cornelius Emeka Agu, (2017), Evaluation of drag models for CFD simulation of fluidized bed biomass gasification. Simulation, Proceedings of the 58th International Conference of Scandinavian Simulation Society, SIMS 2017, Reykjavik, Iceland. Rajan K. Thapa & Britt M. Halvorsen Thapa, (2016), Riser of Dual Fluidized Bed Gasification Reactor: Investigation of Combustion Reactions, 9th EUROSIM Congress on Modelling and Simulation, EUROSIM 2016, September 12th -16th, Oulu, Finland. Kjell-Arne Solli, Rajan Kumar Thapa, Britt Margrethe Emilie Moldestad, (2016) Screening of kinetic rate equations for gasification simulation models, 9th EUROSIM Congress on Modelling and Simulation, EUROSIM 2016, September 12th -16th, Oulu, Finland. R.K. Thapa, A. Frohner, G. Tondl, C.Pfeifer & B.M. Halvorsen, (2016), Circulating fluidized bed combustion reactor: Computational Particle Fluid Dynamic model validation and gas feed position optimization. Computers & Chemical Engineering v.92 pp. 180-188. Cornelius E. Agu, Marianne S. Eikeland, Lars-André Tokheim and Britt M. Halvorsen, (2016) Simulation of Bubbling Fluidized Bed Using One-Dimensional Model Based on Euler-Euler Method, 9th EUROSIM Congress on Modelling and Simulation, EUROSIM 2016, September 12th -16th, Oulu, Finland. Janitha C. Bandara, Rajan K. Thapa, Britt M.E. Moldestad, Marianne S. Eikeland, (2016) “Simulation of Particle Segregation in Fluidized Beds, 9th EUROSIM Congress on Modelling and Simulation, EUROSIM 2016, September 12th -16th, Oulu, Finland. R.K.Thapa, C. Pfeifer, B.M. Halvorsen, (2014), Modeling of reaction kinetics in fluidized bed biomass gasification reactor, International Journal of Energy and Environment, Volume 5, Issue 1, 2014, pp. 35-44. Thapa, Rajan Kumar; Halvorsen, Britt Margrethe, (2014), “Heat transfer optimization in a fluidized bed biomass gasification reactor”. WIT Transactions on Engineering Sciences 83, 2014. Thapa, Rajan Kumar; Pfeifer, C; Halvorsen, Britt Margrethe, (2014), Influence of size and size distribution of biomass and bed material on performance of a dual fluidized bed gasification reactor, CFB-11; 2014-05-14 - 2014-05-17, 2014. K.K. Perera, R. K. Thapa & B. M. Halvorsen, (2014), Simulation and optimization of the steam gasification process using CPFD, Energy Production and Management in the 21st Century, 2, pp. 12151226, 2014.